Toshiba's GridDB is an open source specialized data store purpose-built for handling enormous amounts of data generated by the Internet of Things (IoT). 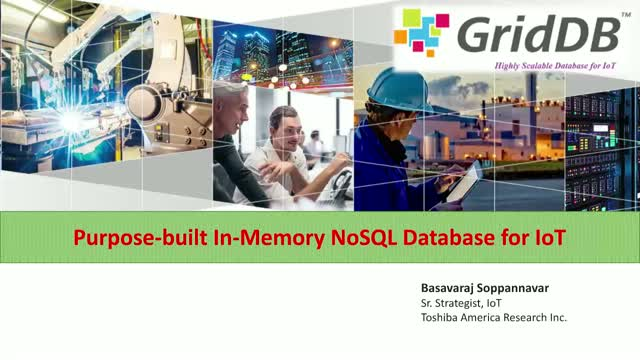 GridDB offers in-memory processing to boost performance, time-series functionalities for IoT data, excellent scale-out on commodity hardware for increasing data needs and great reliability for mission-critical applications. Toshiba has been building large scale IoT projects even before IoT was known as IoT. GridDB was conceived at Toshiba in 2013 to solve growing data needs and time-series data related problems that its customers faced. Since 2014 Toshiba’s customers in Japan spanning industries such as utilities, manufacturing, building management etc. have been harnessing the power of GridDB. Basavaraj Soppannavar, Sr. Strategist IoT, Toshiba America Research Inc. Presented by: Basavaraj Soppannavar, Sr. Strategist IoT, Toshiba America Research Inc.